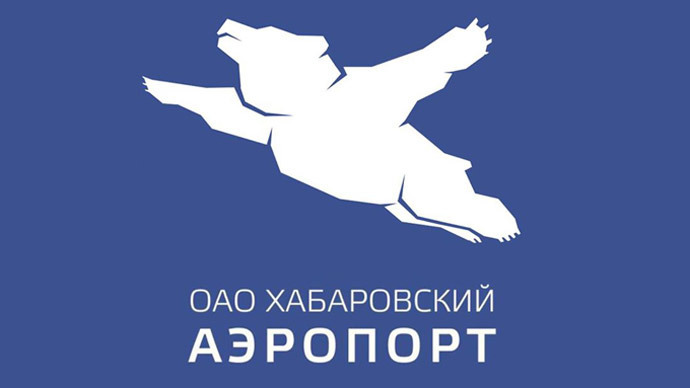 The alleged new logo of Khabarovsk airport. A logo of a flying bear has become an internet sensation in Russia. Users morphed the polar bear into a number of images, such as a rhythmic gymnast, while the airport in Khabarovsk in Russia’s Far East is denying the bear is its new emblem. The large white mammal has caused an internet storm in Russia, with bloggers both supporting and ridiculing the logo design. However, not everyone has been as enthusiastic. Bloggers from Khabarovsk and other Russian cities have wondered why the airport would chose such a “strange and awful” design and how the tender could spend the allocated 800,000 rubles ($115,000) on the project, local media reported. Journalist Oleg Kryuchek made the discovery and his post on Facebook, which was entitled “For friends who are not from around here. The official logo. Share in our sorrow,” has almost 1,000 ‘likes’ and in excess of 2,000 shares. Many bloggers were at a loss to why a white polar bear was chosen and not, for example, an Asian brown bear, which is native to Russia’s Far East. They could not understand the logic behind the design as Polar Bears are sea mammals, but there is no sea in the Khabarovsk region. Some of the most creative images involved two of the world’s most famous paintings. “Over the Town” by Marc Chagall was transformed to have the white polar bear replacing the Chagall’s wife flying over the town of Vitebsk, where the acclaimed painter grew up. A resident of the city of Vladimir, which is one of Russia’s oldest settlements, produced a logo of his own that could be used for its airport, featuring the city’s emblem, a lion. Meanwhile, the image of the bear even became a rhythmic gymnast – bears have been noted for their ability to perform tricks in circuses. The flying polar bear logo was found on the website of the 2015 World Bandy Championships, which will take place in the city in March. However, the airport denies it is their new symbol and says the tender to find a new design is still continuing.